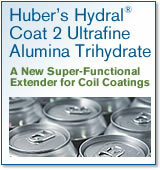 We’re excited to announce the launch of yet another outstanding extender with numerous benefits…Hydral® Coat 2 Ultrafine Alumina Trihydrate (ATH) for use in coil coatings and other high performance coatings-related applications. To learn more now, click on the image at right. In coatings applications with low film thicknesses, extenders are not commonly used because they adversely affect the gloss and/or performance properties. We’ve generated data comparing high-gloss white and black coil coatings without extenders versus the same coatings extended with Hydral Coat 2. The coatings delivered the same performance, including 2,000 Hours of QUV weathering. In addition to a partial replacement of titanium dioxide (TiO2), Hydral Coat 2 replaced a portion of resin content. The result is a lower cost per gallon without any adverse impact on aesthetics, flexibility or durability. In the black, high-gloss coil coating formulation, a ladder study ranged from 1.5% PVC to 10% PVC without a loss in jetness or gloss. Hydral Coat 2 has a relatively low specific gravity, so it is more economical than precipitated barium sulfate on a cost-per-gallon basis, and it has a reduced tendency to settle in low viscosity systems. These are important characteristics in coil coatings applications. We are excited about this new technology and look forward to supplying you with more information and Hydral Coat 2 product samples. For more information, click here.